Direct Oceanfront Living !! The Lanai!! Direct Oceanfront Living at it's finest! Living Room area that has a couch that's a pullout! Gorgeous Kitchen! Right on ocean! Master bedroom has great King Sized bed and this bedroom faces the water!! 2 twins in 2nd bedroom! Bathroom 2 downstairs. Walkin shower. Ready to come to Hawaii?! 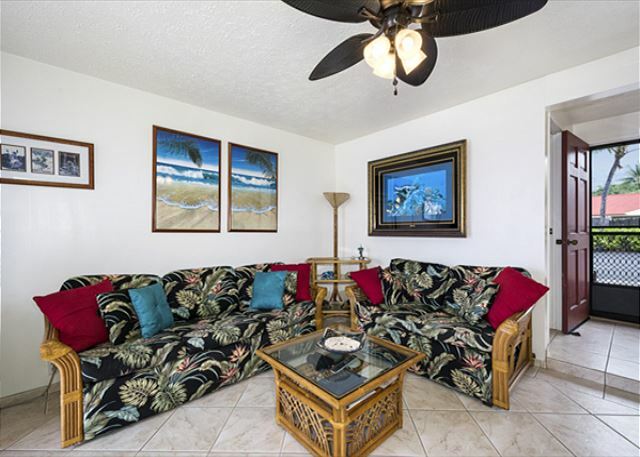 This is a great direct oceanfront townhome! Direct oceanfront living!! Gorgeous Remodeled Pool in 2016!! Aerial Shot of the grounds! Common area of the grounds! **DIRECT OCEANFRONT LIVING AT IT'S FINEST! ** Townhome#185 is an amazing DIRECT oceanfront property at a amazing value. Enjoy the privacy of a townhome. Living area & Kitchen downstairs, bedrooms upstairs. Wifi, Beachgear available to you for your convenience! 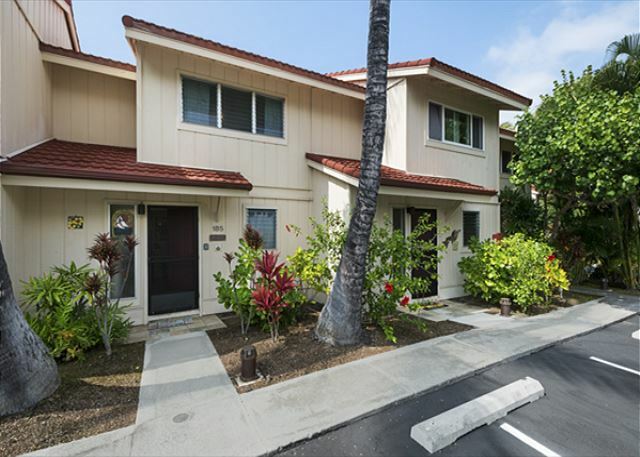 The Keauhou Surf and Racquet Club is a gated community of condominiums and towhomes. There are three professional style tennis courts with night lighting; a tennis pro is on hand daily for lessons or game improvement coaching. The large, newly remodeled swimming pool is ideal for “laps” and also for small children water activities. Swimming pool based exercise sessions are offered each morning. Showers and restrooms are conveniently located in the large pavilion near the swimming pool and tennis courts. One of the most interesting features of the Keauhou Surf and Racquet Club are the numerous archeological sites. These preserved areas provide a glimpse of Hawaiian life years ago. Each site has a posted description of the activities that took place years and years ago. The Keauhou Surf and Racquet Club has many gardens and walking trails. Flowers and tropical foliage are abundant. There are several outdoor barbeque areas for guests to use. The Big Island is also known as the golf capital of Hawaii with 16 courses, 11 that are located in West Hawaii. There is a new driving range called the "Swing Zone" located near the Kailua Pier, for anyone who wants to brush up on a short stay. My wife and I had a wonderful time staying in unit 185. Very relaxing, drinking coffee and eating our papaya just outside the unit right by the ocean before we went out for a run and then a swim in the pool just outside the unit across the drive. Location made it real easy to get to our favorite eating and happy hour places. Will definitely consider this for next year. Aloha, John and thanks for staying with us at Keauhou Kona Surf & Racquet Club #185!! It's a prime location for a townhome, and it's nice to hear that you were able to take advantage of the great oceanfront living it provides. We'd be happy to have you again next year, and hope to hear from you soon!! Mahalo! Great location for Kona activities. 1 minute to snorkeling or surfing at Kahalu’u beach. Convenient strip mall half a mile away for groceries / restaurants. 15 minutes to Kona Town. Nice having patio / lanai right on the ocean walk. If heading to Volcano Natl Park, Hamakua Coast or Ka Lae (South Point), you might want to stay in Hilo, Waimea, Volcano, etc. to cut down on long drives and experience the other towns. But if your trip is focused on activities around Kona, this is a great location. Very pleased with our choice, which fully lived up to our expectations. 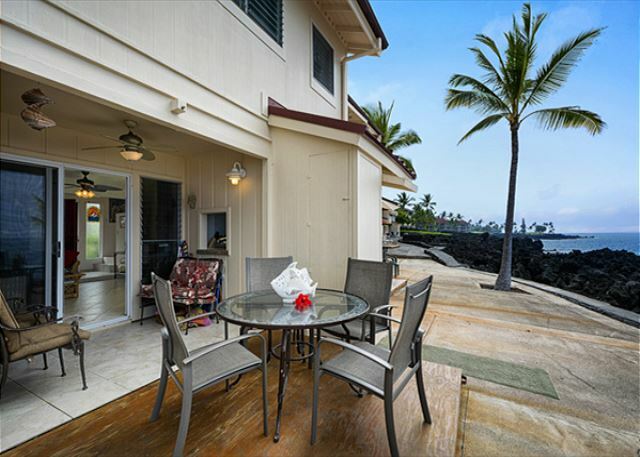 Very conveniently located with patio overlooking waves breaking on lava below. Spectacular sunset views. Only slight problem was need for shutter to be erected on patio for two days of stay because of high waves. Conveniently placed within resort close to pool. Also very close to extensive shopping centre with supermarket and close to good snorkelling at Kahalu'u beach. Good access to number of historical sights along the west coast. On trip to Volcanoes National Park, we enjoyed the quiet rural Ka'alaiki Rd from Na'alehu to Pahala and on the return trip saw number of turtles on black sand Punalu'u Beach. Art galleries in Holualoa Vilage well worth a visit. Overall a very enjoyable stay and would certainly recommend to friends. Note so sure about long term prospect for site if sea levels rise! Enjoy it while you can. Aloha Roderick, and thank you for sharing your review with us! We're happy to hear you enjoyed your time at KKSR 185. Sounds like you had a memorable time filled with lots of adventures around the island! We hope to see you again soon. Mahalo! Obviously, we had an incredible time on the Big Island - how could you not?! This rental was lovely and close to everything. We spent every sunrise and sunset on the lanai, enjoying the view and the sound of the waves. The pool was great and the sandy beach just north of the property was a wonderful surprise. 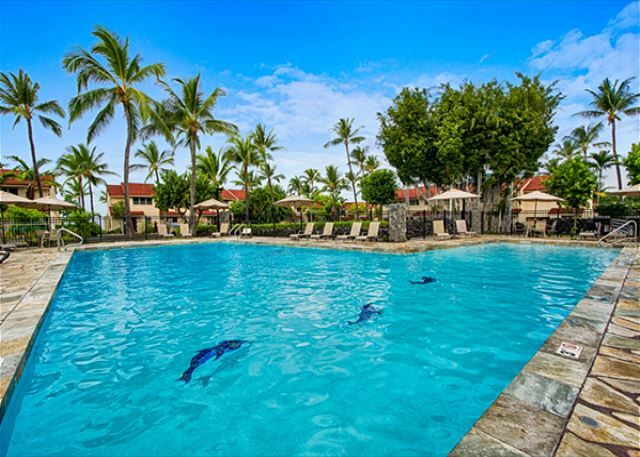 We're so happy to hear you enjoyed your stay in Kona at the Keauhou Surf & Racquet Club. Mahalo & we hope to see you again! Knutson Properties hosts a great vacation experience. I have been visiting Kauai for over 20 years and decided to try a trip to the big island this year.I found Knutson Properties through VRBO. They pictures represented the property and my condo was very clean and well maintained. I would use them again. Mahalo for choosing us for your stay and to welcome you to the Big Island! We're thrilled you enjoyed your stay and were so pleased with your unit. We look forward to having you again! Every aspect of our experience with Knutson & Associates for our stay in Kona was wonderful - from the initial reservation months ago through the slightly extended check-out on our last day. The staff, including a very responsive Blake, took care of any questions or needs we had very quickly and completely to our satisfaction. Such a professional management company makes such a difference in the quality of the property, the customer service and the vacation experience. The townhome was exactly as described and expected, based on the pictures on the listing. We ate every meal (when at home) on the oceanfront lanai - at that exact table you see with the palm trees and water steps away. Our family of 5 was very comfortable, and the two-story set-up was a big part of that - bedrooms upstairs and living area on first floor. We loved having the huge pool just outside our front door and the ocean out our back. The location was fantastic for all of our activities in the area, too. A full-service grocery store (KTA) is two minutes away in a shopping plaza, and the Beltline to get around the area quickly is nearby too. The main commercial area of Kailua-Kona is about 15 minutes up Ali'i Drive - just far enough away from the crowds for us. Finally, and perhaps most importantly, two great beaches we enjoyed nearby are Kahalu'u Beach within walking distance with fantastic snorkeling and Magic Sands Beach a short drive away with easy parking. Thank you for a fantastic HI experience! Aloha Craig, and thank you for such kind words! We're always happy to accommodate your stay and to assist in any way possible to make your vacation as special as possible. Mahalo & we hope to have you with us on the Big Island again soon! The location is perfect, you have the waves in your backyard, the house is cross street of the pool, very close to a shopping center that has restaurant and KTA grocery store. The house itself is in good condition, the only thing I need the owner or rental should consider is to update the bedding and towels. All the bedding look very old and so are the towels, I mean I wouldn't give them to use for my guests. And it is not that expensive to buy new towels and bedding. Wonderful sitting on back deck as waves hit the rocks below. Clean and in good repair, with a few minor exception of no consequence.. much better than staying at a fancy hotel. Great pool and barbecue area. 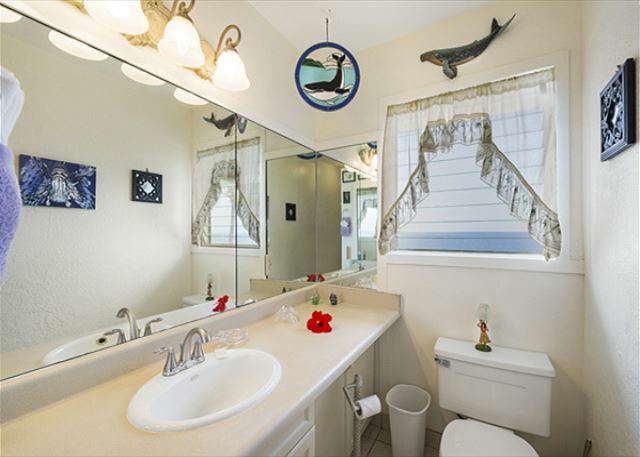 Beautiful Oceanside Condo, conveniently close to everything but not crowded or congested. Memories of sunsets you can take with you. What a delight! Perfect Location and Ambiente and vacation home. The whole Family enjoyed it very much. 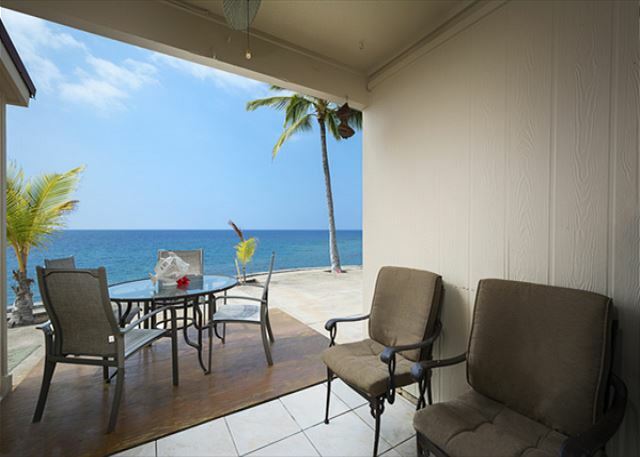 Great place right on the ocean and close to Alii drive and lots of beaches and restaurants without being in the center of a busy tourist area. Lack of air conditioning made it slightly uncomfortable during the hottest part of the day, but the ocean breezes cooled us at night. The accommodations were clean and decor was pleasing. It was great except the dryer didn't work. The sliding door didn't work but the management company quickly sent a person around to remedy the situation. Our experience from the time of reservation to leaving the resort was joyful and seamless. Knutson & Associates was very accommodating in changing our dates without hesitation when we requested a change due to flight changes. The town home's beach front location is absolutely mesmerizing from its ocean views, gentle breezes, beautiful sunsets. Need groceries - No worries. The town home is located within walking distance of a mini-mall. Enjoy snorkeling in reef & tropical fish laden cove located about a half mile away. LOVED the Condo, the location, the neighbors were awesome, the pool, the Lanai, all the comforts of home. Only bad thing was the place needs a very GOOD clean job throughout the condo from top to bottom. We were truly happy to stay here. Great house and A+ management! Excellent. Well worth the money. Staff from Knutson are friendly, helpful, organized and sometimes - funny! The town house we stayed in was perfect for three adults and would be good for a party of four. But, more than that, things would get a little crowded. The property was perfect!! We enjoyed all of our meals on the lanai overlooking the ocean, used many of the house items throughout the week and did our part by donating a rice cooker for all to use. We did experience some high ocean swells, which meant that the storm door had to be closed from Friday evening through Sunday late morning, that was a bummer. In closing, we all had a wonderful time and look forward to using this property again!! THIS CONDO WAS AWESOME, VERY CONVENIENT LOCATION CLOSE TO ALL THE EXCITEMENT. PROPERTY MANAGEMENT KNUTSON (BLAKE) WAS AWESOME, VERY FRIENDL AND HELPFUL. I WILL DEFINITELY RETURN AND RENT THIS CONDO AGAIN. The oceanfront location was breathtaking. Lanai area is the place to eat meals and watch for dolphins,whales which we saw from here in our short stay. Lanai area feels pretty close to neighbours, but this unit is one of the best for proximity to the ocean and some privacy. There was a small storm while we were there - crashing waves put me to sleep, but my wife found the sound mildly disturbing at night. Kitchen cabinets are a bit worn, but this was a great place to stay. We were so busy with other things that we didn't even have a chance to try the pool and tennis, which we would have if we had stayed longer. Close to Keauhou Bay for snorkel boat outings to Captain Cook area, and easy drive along Ali'i Drive right into Kailua-Kona downtown. We had a great time- spent a lot of time in the pool and in the ocean. This was the second time that we've stayed at this condo. We really like the location, the view and the property. The owner should provide an umbrella for use on the lanai. The sun and sunsets are outstanding, but protection from the sun in the afternoon would be a tremendous asset. 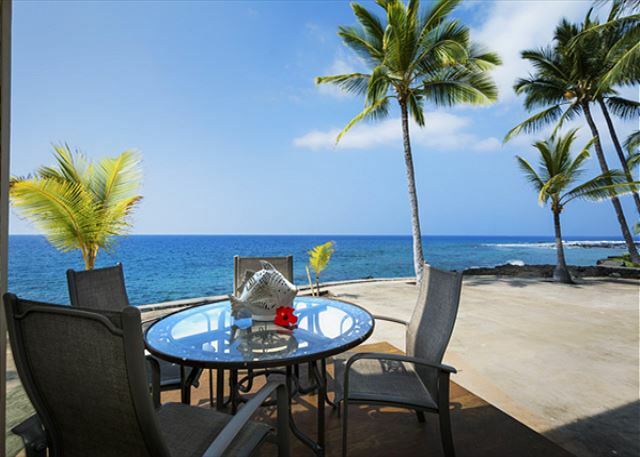 Thank you so much for your wonderful review on the gorgeous, direct oceanfront Keauhou Kona Surf and Racquet Club 185. We will certainly provide this feedback to the owner about the umbrella recommendation. We hope to see you again next year! -Blake Kessner, Property Manager. Completely on the water. If you like the roar of the sea, this is the place for you. It was nice for the kids to be able to walk out the other way and directly to the pool. We would definitely rent this place again. You can walk ten minutes north on Ali'i Road to the beach park for some really good snorkeling, with turtles, even! The sights and sounds from the lanai were amazing. We saw humpback whales and spinner dolphins from our lanai, as well as beautiful sunsets, and the sound of the surf put us to sleep at night. The pool and tennis courts are right across the way from this unit, and there are tennis racquets and balls in the upstairs closet. This property was built on and adjacent to a rich archaelogical site, which is a shame because I'm sure a lot was destroyed in the process. Within a short walk from your door you can find petroglyphs, remains of a "Men's House," and even what is believed to be the residence of four Hawaiian kings. However, if you rent #185, bring some brightly-colored tape and mark the step between the entrance area and the living room. I hope Knutson will mark this step in some way! But until they do, it is a real hazard, and several of us stumbled and even fell the first couple days we got there, until we taped it to make it more obvious. Manny of the appliances did not work or were worn out and the electrical problems caused our stay to be less than pleasant. Keauhou Kona Surf and Racquet Club #185 for 7/23/13 - 7/30/13. 95% perfect, very nice!! Just want to mention that when we arrived the lock box was already set to the code in my letter from K&A and the key was not in the box. I had to call the resident maintenance guy Albert to open the unit. We were a bit paranoid after that about someone using the missing key to enter the unit while we were out. I called Nick and left a message, then later talked to a lady (forgot her name) at K&A who was very helpful. Other small complaint was no password for the wireless internet. Other than these 2 things everything else was excellent! Thank you!! From the moment we arrived at the gates the vacation rental was what we expected. The unit itself was roomy. We loved the fact that the bedrooms were separated upstairs from the living quarters. Everything we needed was there from a well-stocked kitchen, cozy lanai, bedding, towels, etc. We could see the pool from our place but even though it was close it was not loud. It was convenient to get groceries up the street at the mall. The beach to go snorkeling was ½ mile up the road. There was so much to do from exploring the rain forests, driving to the top of one of the volcanoes as well as a spectacular sunset, to walking in old lava tunnels. We even took a helicopter ride around in Hilo on the other side of the Island to see the lava/waterfalls! The difference in landscape is almost indescribable. We enjoyed the unit and would recommend it to everyone! Our place was so comfortable and the beds were just right. Front row seat in PARADISE! We had a wonderful time staying in this condo. The location couldn't be any better. The first night we had trouble sleeping because the crashing of the waves was a new wonderful sound for us, however the next 6 nights were amazing! We were traveling with 2 teenagers and they enjoyed the condo as well. I would love to stay in this location again. The location is excellent. The condo is right on the ocean front and the view is amazing. The condo complex is gated; a very nice feature. Although the condo is slightly outside Kona, there is a neighborhood shopping center very close by. All in all we enjoyed it and will stay here again if the price is right! We really enjoyed the condo, the location and the amenities. We couldn't have asked for a place closer to the water with more spectacular views. We had all our dinners on the lanai as the sun was setting. We enjoyed the use of the portable grill for outside cooking. A sun umbrella would be a nice addition to the lanai furnishings, however we were able to borrow an umbrella from a neighbor during our visit. We very much appreciated approval for the late checkout, given our flight schedule. This townhome has an incredible ocean view and it is right out the sliding glass doors!! We can not express how wonderful the view is. The home does not have A/C and it did get a little uncomfortable even with the ceiling fans. We would stay here again. Great experience. If staying in Kona again, I will most definitely stay here again. Knutson was very easy to work with and everything went just as detailed in their communications. If you would like to stay away from crowds and listen to the Ocean and birds, this is the place to go. Good place to stay but wish it had air conditioning. We loved condo 185 and would love to stay there again. The location was great for snorkeling and surfing. The view from the porch was fantastic! We enjoyed hearing the surf at night when we went to sleep. I have already recommended it to people we know. The floors and small rugs were dirty. the fire alarm stared chirping in the middle of the night. I left a note about this. there was no extra rolls of tolet paper, just what was on the roolers,and no extra roll of paper towels. The black chairs at the dining table were peeling off and left little black pieces all over your back and legs, had to cover them with a towel. Aloha Hubert. I am sorry that you were not completely satisfied. The cleaners leave a starter supply of basics, such as a roll of toilet paper for each bathroom, one roll of paper towels. Anything that you need after that, you would need to purchase. The dining chairs were inspected, and replaced. The fire alarm batteries are changed periodically, and i apologize if they chirped while you were there. The rugs that you noted were dirty have been replaced as well. I hope you will give us another opportunity to serve you. Aloha!